WHO: Luxury Avenue, an innovative concept in travel retail, brings together the worlds most sought after designer boutiques complemented by immeasurable value in the luxurious vacation settings of Cancun and Los Cabos, Mexico. WHEN: The Luxury Bar and Café located on The Mezzanine Level of Luxury Avenue Cancun is now open daily from 12:00pm – 9:00pm. 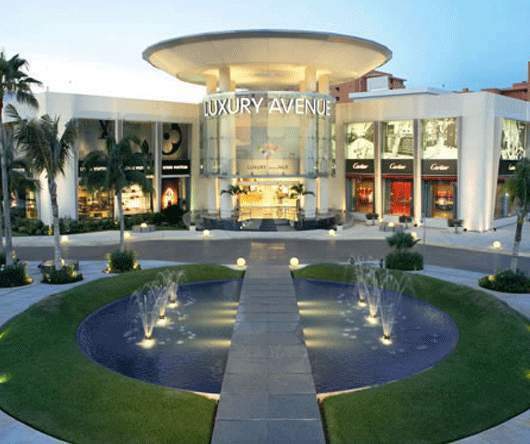 WHAT: Luxury Avenue Cancun’s newest venture invites shoppers to stop, drop and sip after a long day of shopping in the mall’s brand name boutiques. The Luxury Bar and Café offers a welcome respite for visitors to the Riviera Maya’s only boutique shopping mall. The chic Luxury Bar and Café is the perfect spot for a quick lunch, a glass of wine with friends or something more celebratory – a bottle of Veuve Clicquot, which is always on ice. While sipping on the famous French champagne, shoppers can relax in the bright pink loveseat that was given to Luxury Avenue by Veuve Clicquot and created by world-renowned designer Karim Rashid. And for those husbands and boyfriends who are not interested in perusing the stylish boutiques? They can enjoy the free wireless Internet available at the Luxury Bar and Café. WHERE: Luxury Avenue Cancun is located in the heart of the Cancun Hotel Zone, at Plaza Kukulcan.